India is steeped in a synthesised controversy created by Monsanto on the first GM crop, supposedly approved for commercialisation. Engaged in litigation on many fronts, Monsanto is trying to subvert our patent laws, Protection of Plant Variety and Farmers Right Act, Essential Commodities Act and Competition Act. It is behaving as if there is no Parliament, no democracy, no sovereign laws in India to which it is subject. Or it simply doesn’t have any regard for them. In another theatre, Monsanto and Bayer are merging. They were one as MoBay (MonsantoBayer), part of the poison cartel of I.G. Farben. The controlling stakes of both corporations lie with the same private equity firms. The expertise of these firms is in war. I.G. Farben, Adolf Hitler’s economic powerhouse and pre-war Germany’s highest foreign exchange earner, was also a foreign intelligence operation. Hermann Schmitz was president of I.G. Farben, Schmitz’s nephew Max Ilgner was a director of I.G. Farben, while Max’s brother Rudolph Ilgner ran the New York arm as vice-president of Chemnyco. Paul Warburg, brother of Max Warburg (board of directors, Farben Aufsichtsrat), founded the US Federal Reserve System. Max Warburg and Hermann Schmitz played a central role in the Farben empire. Other “guiding hands” of Farben Vorstand included Carl Bosch, Fritz ter Meer, Kurt Oppenheim and George von Schnitzler. Each of them was adjudged a “war criminal” after World War II, except Paul Warburg. 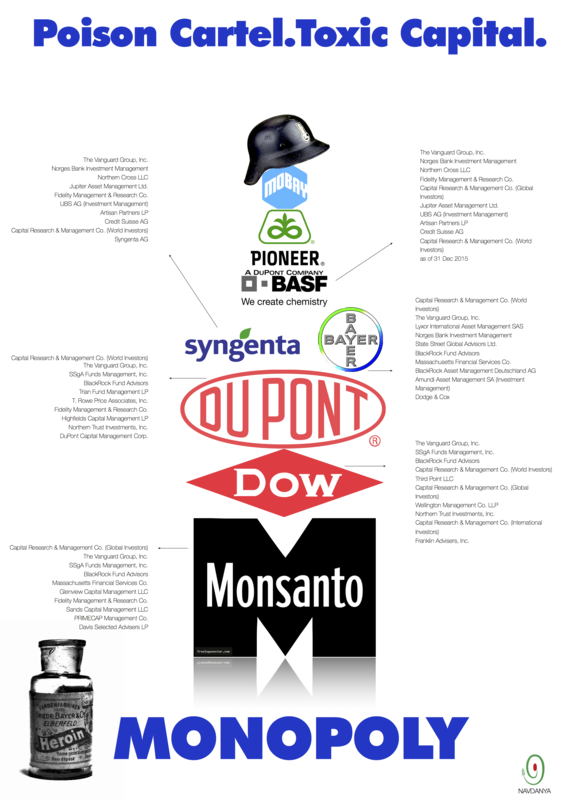 Monsanto and Bayer have a long history. They made explosives and lethally poisonous gases using shared technologies and sold them to both sides in the two world wars. The same war chemicals were bought by the Allied and Axis powers, from the same manufacturers, with money borrowed from the same bank. MoBay supplied ingredients for Agent Orange in the Vietnam War. Around 20 million gallons of MoBay defoliants and herbicides were sprayed over South Vietnam. Children are still being born with birth defects, adults have chronic illnesses and cancers, due to their exposure to MoBay’s chemicals. Monsanto and Bayer’s cross-licensed Agent Orange resistance has also been cross-developed for decades. Wars were fought, lives lost, nations carved into holy lands — with artificial boundaries that suit colonisation and resource grab — while Bayer and Monsanto sold chemicals as bombs and poisons and their brothers provided the loans to buy those bombs. More recently, Bayer CropScience AG and Monsanto are believed to have entered into a long-term business relationship. This gives Monsanto and Bayer free access to each other’s herbicide and paired herbicide resistance technology. Through cross-licensing agreements, mergers and acquisitions, the biotech industry has become the I.G. Farben of today, with Monsanto in the cockpit. The global chemical and GMO industry — Bayer, Dow Agro, DuPont Pioneer, Mahyco, Monsanto and Syngenta — have come together to form the Federation of Seed Industry of India (FSII) to try and become bigger bullies in this assault on India’s farmers, environment and democratically-framed laws that protect the public and the national interest. This is in addition to Association of Biotechnology-Led Enterprises (ABLE), which tried to challenge India’s seed price control order issued under the Essential Commodities Act in the Karnataka high court. The case was dismissed. The new group is not “seed industry”; they produce no seeds. They try to stretch patents on chemicals to claim ownership on seeds, even in countries where patents on seeds and plants are not allowed. This is the case in India, Argentina, Brazil, Mexico and many other countries. All Monsanto cases in India are related to Monsanto un-scientifically, illegally and illegitimately claiming patents on seed, in contempt of India’s laws, and trying to collect royalties from the Indian seed industry and farmers. The FSII is an “I.G. Farben 100-Year Family Reunion”, a coming together of independent and autonomous entities. The Farben family chemical cartel was responsible for exterminating people in concentration camps. It embodies a century of ecocide and genocide, carried out in the name of scientific experimentation and innovation. Today the poison cartel is wearing G-Engineering clothes, and citing the mantra of “innovation” ad nauseam. Hitler’s concentration camps were an “innovation” in killing; and almost a century later the Farben family is carrying out the same extermination — silently, globally and efficiently. Monsanto’s “innovation” of collecting illegal royalties and pushing Indian farmers to suicide is also an innovation in killing without liability, indirectly. Just because there is a new way to kill doesn’t make killing right. “Innovation”, like every human activity, has limits — set by ethics, justice, democracy, the rights of people and of nature. I.G. Farben was tried in Nuremberg. We have national laws to protect people, their right to life and public health, and the environment. India’s biosafety and patent laws, and the Plant Variety Act are designed to regulate greedy owners of corporations with a history of crimes against nature and humanity. Industry is getting ready to push its next “gene”, the GM mustard (DMH-11). The GM mustard, being promoted as a public sector “innovation”, is based on barnase/barstar/gene system to create male-sterile plants and a bar gene for glufosinate resistance. In 2002, Pro-Agro’s (Bayer) application for approval of commercial planting of GM mustard based on the same system was turned down. Before any approval is granted to genetically-engineered mustard, the issue of limits to patentability needs to be resolved on the basis of Indian laws, and patents on plants and seeds and methods of agriculture must not be allowed. Deepak Pental, a retired professor and GM-Operative, will not commercialise GM mustard seed. His officers at Bayer/Monsanto/MoBay will. At the core of socio-economic assessment is the issue of monopolies and cartels, and their impact on small farmers. Even though patents on seeds are not allowed, for more than a decade and a half Monsanto has extracted illegal royalties from Indian farmers, trapping them in debt, and triggering an epidemic of farmers’ suicides. Monsanto’s war on India’s foot soldiers — farmers — is a war being waged by the Farben family, on our earth family.